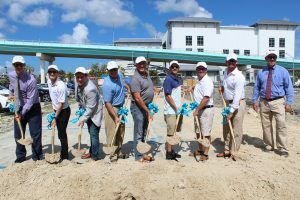 In September, Carroll Properties broke ground on a new dry storage facility in Fort Myers Beach, Florida. The marina is the first in its area to use automation smart technology to replace traditional forklift operations, and the first to use ASAR technology to automate the storage and retrieval process. 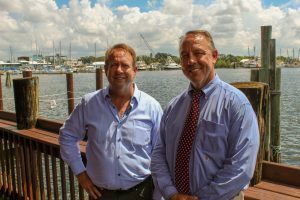 Todd Carroll, owner of Gulf Star Marina, had long been in discussion about smart technology for drystacks for some time, with GCM Contracting Solutions, a commercial construction and design-build contractor, now the exclusive international distributor for the automated technology. The old dry storage building at Gulf Star Marina was ready for an update. The Carroll family bought the facility in 1991. The family, which was originally in the hotel business in Cincinnati, Ohio, moved to Southwest Florida for first hotels, then later ventured into marinas. The family bought Calusa Isle Marina, another dry storage facility, in 1986. In 2003, Todd bought out his father’s partner and joined the family business. The original metal building had been built in the late 60s. “That was really a landmark for that location for 30 plus years,” Carroll said. However, by the time Carroll joined the business, the metal barn had far exceeded its life expectancy in the rough saltwater environment. dry storage facility. Around this time, he met Robert Brown, owner and president of GCM, (their sons went to school together). In 2008, Brown and GCM built Hamilton Harbor in Naples. “I watched him build that marina out of concrete, a very successful marina for that market,” Carroll said. And Carroll kept watching and talking with his friend. GCM built another facility on Marco Island, Rose Marina, in 2016. “And I watched him build that very carefully,” Carroll said. He often visited the project sites. Carroll and Brown also began talking about and researching automated systems for dry storage. They took a trip to Atlanta to a robotics show, where they met the crew from LTW. Although LTW did not currently have an automated system for the marine industry, they had been doing stacker cranes since the early 80s. “We went to see a warehouse operation that services the Atlanta school district,” Carroll said. He and Brown were blown away by the operation. But it would get a little more difficult, before it got easier. Before the project could take off, the economic downturn happened, and the project got shuttled. 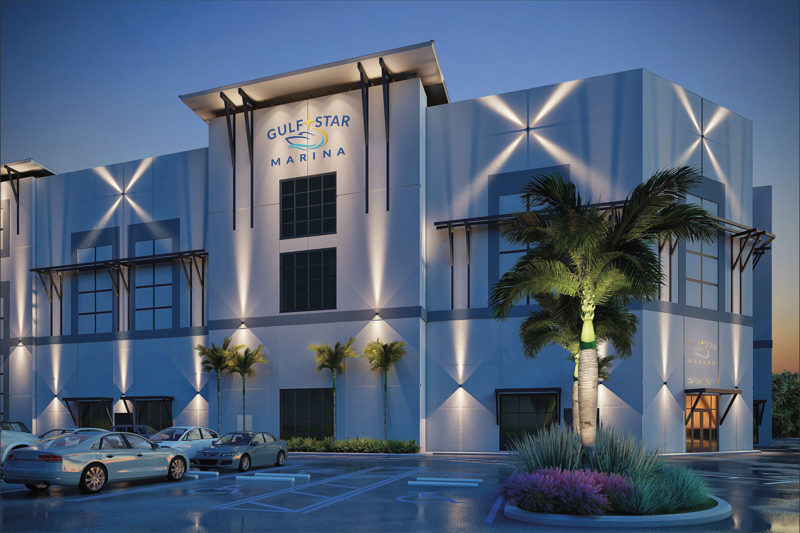 Gulf Star Marina maintained operations through the tough economic times, and when the economy got better, the project already had some momentum. It took numerous meetings between Carroll, GCM and LTW to develop a plan and visualize the full project, but it moved fairly quickly once the project ramped up again about two years ago. When Brown and Carroll first started talking about the Gulf Star Marina project, the boating market was a very different place. “It was going to be more of a go-fast boat marina with a restaurant,” Brown said. Now, many of the dry storage facilities built before the economic downturn can’t handle a vast majority of the boats on the market. The biggest demand on dry storage space, Brown said, is now for height, as well as length. Boats are getting bigger, but also taller. Dry storage facilities need to accommodate more T-tops, towers and radar arches. The new Gulf Star Marina will handle boats up to 40 feet, 14 feet in height, 15 feet in width and up to 20,000 pounds. Carroll said they did consider going up to 50 feet in boat length, but for each additional foot in storage space for the boats, the facility needs additional aisle space. “It’s a balancing act,” Carroll said. “We came back to where the majority of the market was at.” Most of those stored out of the water are 40 feet and under, he said. However, he has plans for larger marinas. The Gulf Star Marina property and building is fairly small, and that footprint can’t be expanded. “The next one we want on larger ground to handle bigger boats,” Carroll said. 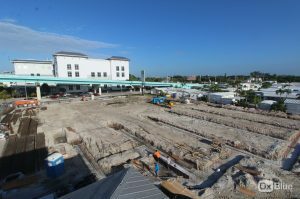 Instead of a metal beam structure, GCM is building a tilt-wall concrete building. The 29,000-square-foot facility will be 65 feet tall and hurricane-rated for 200 mph winds. “These concrete structures you can design to look like whatever you want,” Carroll said. The facility will also have a fuel dock, ship store and access to Doc Ford’s restaurant, located next door. The marina will provide some service, and third-party contractors that are properly insured and have signed off on the rules and regulations can also do work in an indoor, air-conditioned maintenance bay at the new facility. Instead of a forklift or crane operation, GCM and LTW are building a railed system that will move boats from the building to the water. The large rail system runs along the center aisle with boats on either side. The aisle needs to be only 2 feet wider than the longest boat. The boats are transported to a tunnel that goes outside to the water, where a platform lift takes boats to the water or pulls them out to transport them back into the building. Boats can also be moved to a staging dock area. The facility will have about 20 wet slips. Individual cradles will be fitted for each boat. Each cradle will be pre-made and adjusted to fit each vessel. The bottom side is manufactured to fit the transport shuttle on the rail system and the top side can be widened or angled to fit various hulls. The system can keep track of every boat and every cradle, where it is in the building at any given time, and it tracks usage. It uses this data to organize boats and prep vessel placement for upcoming launches during downtime. the crane, and those used more often are closer to the door,” Carroll said. Boats can also be stored two or three vessels deep, and the rail system can store large boats at the top. Gulf Star Marina will also have a smartphone app where boaters can request launches. That project is being done in-house with an app designer. “We came up with the criteria and how we want it to look and all the functions,” Carroll said. The tech experts do the rest. GCM and LTW are building the all-electric crane in Austria. It has dual drive motors and dual lift motors. If one goes down, the system can still operate at a slower speed. The crane was scheduled to leave Austria in November to arrive on-site in mid-January 2019. Installation for the building foundations began in October. Piles go in first, which hold the bottom of the foundation, and support the stem wall, where the tilt-wall panels will sit. This project has 106 auger cast pile with a bearing capacity of 100 tons each. The construction site in October, after the demolition of the old building, shows the beginnings of the foundation. Before the tilt-walls are constructed, the concrete floor will be next. The floor of the marina then becomes a cast bed for the panels. Up to five panels are poured face down on top of each other. A crane will pick up each panel and set it into place. They are braced temporarily, then bolted into place. The tilt panels will sit on the concrete floor slab, and the auger cast piles contain Rebar that extends into the foundation. “Once we complete the roof structure it actually creates what is called a diaphragm effect. The diaphragm is what completes the strength of the structure. Much like folding the top of a cardboard box,” Brown said. 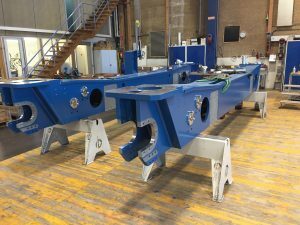 GCM and LTW fabricated the crane in Austria. The chassis are seen here. vessels. This matters in fire suppression. “As you make the compartment smaller, you significantly reduce the water demand,” Brown said. He said this is the first drystack to use this process. The facility is slated to open in early summer 2019. The marina previously employed about three to four on its staff. That number will increase at the new facility. Although the facility won’t employ forklift drivers, it will need more employees to handle more boats and more services. Carroll said the staff will easily increase to 12 for boat handlers, boat detailers, customer service support, mechanical support and more.